What could make this memory type stand out from the next-gen memory crowd. The next-generation memory market for embedded applications is becoming more crowded as another technology emerges in the arena—embedded phase-change memory. Phase-change memory is not new and has been in the works for decades. But the technology has taken longer to commercialize amid a number of technical and cost challenges. Phase-change memory, a nonvolatile memory type that stores data by changing the state of a material, is attractive because it’s supposedly faster than today’s flash memory with better endurance. Like many new memory types, phase-change memory comes in two forms—standalone and embedded. On the standalone front, Intel for some time has been shipping a device called 3D XPoint, a next-generation memory based on phase-change. Intel sells 3D XPoint devices for solid-state storage drives (SSDs) and other products. In addition, Micron is developing the technology. Now, STMicroelectronics is sampling products based on embedded phase-change memory. It is developing an automotive microcontroller (MCU) with embedded phase-change, based on a 28nm FD-SOI technology. So far, STMicroelectronics is the only company to announce embedded phase-change, although SMIC and TSMC are exploring it in R&D. The embedded market is different than the standalone device segment. In embedded, an MCU integrates flash memory for code storage, which boots up a device and runs various programs. Typically, the industry uses NOR flash for the embedded memory, but NOR is running out of steam and may stop scaling at 28nm or 22nm. That’s where embedded phase-change fits, along with other next-generation memory types —they are expected to replace NOR when it stops scaling. Besides phase-change, the other contenders for embedded apps include carbon nanotube RAM, FeFET, FRAM, MRAM and ReRAM. But moving to a next-generation embedded memory type is challenging. Some technologies are just barely ready, while others are still in R&D. And it’s unclear which new memory type will prevail over the long term. Over time, OEMs likely will adopt several new memory types because no one technology can address all applications. But before OEMs adopt anything, the product must meet certain price and performance specs. Today, microcontrollers (MCUs) are used in a plethora of systems, such as aircraft, appliances, cars and medical equipment. MCUs perform the processing functions in the chip and incorporate various components on the same device, such as SRAM, embedded memory and peripherals. For the embedded market, the next-generation memories are targeted for two applications. “All of the embedded technologies are vying for the same prize—to replace embedded EEPROM and NOR flash, and perhaps, eventually, embedded SRAM,” Handy said. SRAM is fast, but it takes up too much space. So the industry is developing a new memory to replace all or part of the SRAM. MRAM is the leading contender, but this technology still must be proven in the field. Embedded MRAM is targeted for SRAM-based cache functions in processors and MCUs. Embedded NOR flash, sometimes called eFlash, is a different application with other issues. MCUs with embedded NOR based on 40nm processes and above are in production today. Then, MCUs at 28nm are ramping up with 22nm and smaller geometries in the works. Regardless, the industry needs a new embedded solution at 28nm/22nm and beyond, and the next-generation memories promise to fill the void. The new memory types also are targeted for the standalone device market. The next-generation memories have been in R&D for years, and in the past the consensus is they would replace today’s memory types, such as DRAM, flash and SRAM, which have various limitations. For example, DRAM is cheap, but it is also a power-hungry device that is volatile. It loses the data when the power is turned off in a system. Then, flash memory stores the data even when the power is off. In operation, though, flash undergoes several read/write cycles when programming, which is a slow process. The new memories are attractive because they combine the speed of SRAM and the non-volatility of flash with unlimited endurance. They also provide single-bit alterability when programming. But the new memories have taken longer to develop than expected. Most make use of exotic materials and switching schemes to store information, and they present some manufacturing challenges in the fab. Plus, the existing memories have scaled much further than previously thought and are cheap. These and other factors have prevented the new memory types from gaining widespread adoption. Nevertheless, MRAM and phase-change for standalone applications are shipping and have made some inroads. They haven’t replaced conventional memories, though. Instead, they work with existing memory to help speed up various tasks in systems. In the embedded market, FRAM and ReRAM have been shipping for some time, with MRAM and other technologies in the works. The decision to use one technology or another depends on several factors. “What are my requirements? How long does it last? The rest is whether it meets all of the reliability requirements and performance requirements. Then, the automotive industry has its own set of requirements, which tend to be more stringent,” Sekiguchi said. Today, the momentum is building for embedded MRAM, as several foundry vendors are developing the technology for customers. GlobalFoundries, Samsung, TSMC and UMC are developing a next-generation MRAM technology called spin-transfer torque MRAM (STT-MRAM). STT-MRAM uses the magnetism of electron spin to provide non-volatile properties in chips. In traditional memory, the data is stored as an electric charge. In contrast, MRAM uses a magnetic tunnel junction (MTJ) memory cell for the storage element. STT-MRAM chips are trickling out into the market for use in SSDs. For this application, the temperature requirements are less rigid. Automotive, a big market for MCUs with embedded memory, has different requirements. “Any emerging nonvolatile memory that will be used in MCUs for automotive have to pass a tough reliability spec. It must meet solder reflow requirements, high reliability and a shelf-life greater than 20 years. Automotive applications require 125°, and Grade 0 requires 150°,” Uriu said. The requirements are even more demanding for advanced driver-assistance systems (ADAS) and autonomous driving technology. ADAS involves various safety features in a car, such as automatic emergency braking and lane detection. In a major milestone, GlobalFoundries recently demonstrated a 22nm FD-SOI technology, which incorporates a 40-Mbit embedded MRAM for automotive-grade-1 (Auto-G1) MCU applications. The technology has demonstrated a sub-ppm BER and a zero failure after 1 million endurance cycles across Auto-G1 operating temperature ranges (-40°C to ~150 °C). Meanwhile, SMIC, TSMC and UMC are developing embedded ReRAM, which is targeted for consumer applications. In ReRAM, a switching medium is situated between a top and a bottom electrode. When a positive voltage is applied on the top electrode, a conductive filament forms between the two electrodes. The filament consists of ion atoms. When a negative voltage is applied on the bottom electrode, the conductive filament breaks. There are different types of PCM memory cells in the market. In one version, a phase-change memory cell consists of four pieces—a bottom electrode, top electrode, heater and GST materials. The GST material is placed under the top electrode. The bottom electrode is separate. The heater, which resembles a via, connects the bottom electrode to the GST/top electrode structure. In operation, the heater changes the cell between the crystalline and amorphous states. 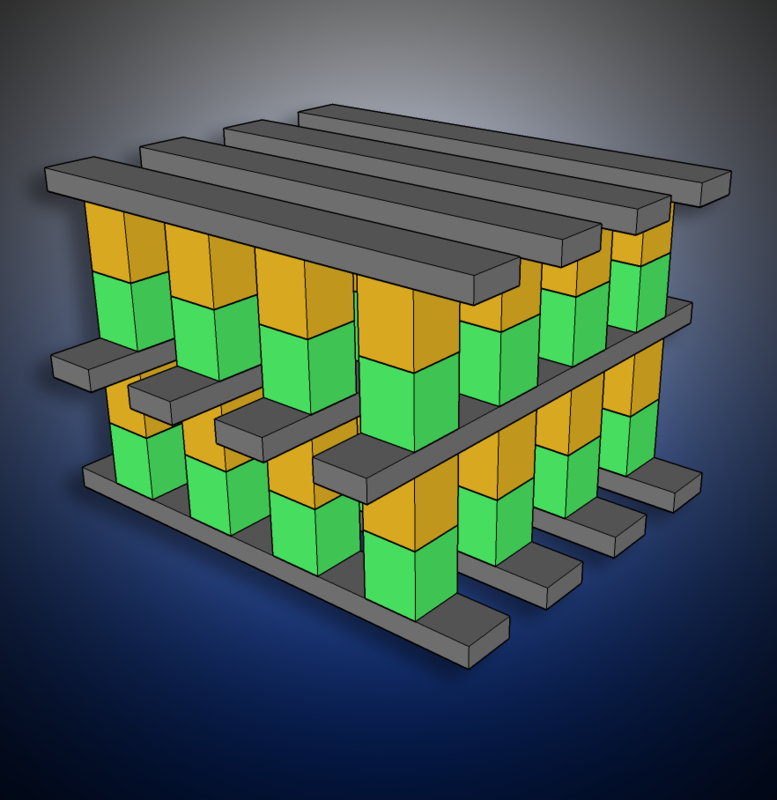 Intel’s 3D XPoint is the most notable example of a phase-change memory. The structure is referred to as a cross-point architecture. Based on 20nm geometries, 3D XPoint is built around a two-layer stacked architecture with 128-gigabit densities. 3D XPoint is a storage-class memory that fits somewhere between DRAM and NAND. It is faster than NAND with greater endurance. For its part, STMicroelectronics is developing an MCU with an embedded 16MB (mega-byte) phase-change memory cell. The MCU is fabricated in a 28nm FD-SOI technology with body-biasing capabilities. A 5-volt transistor has been demonstrated. The distributions of the macro-cell achieved a BER of <10-8 after multiple bakes at 150°C and 10k cycling of code storage memory. Still, embedded PCM must be proven in the field. There are also some technical and cost challenges to make all phase-change memory flavors in the fab. Phase-change memory is based on an exotic alloy, a germanium antimony tellurium (GST) compound, which is a chalcogenide. Generally, each phase-change type requires different process steps in the fab. For example, to make a cross-point device in the fab, the first step is to produce a stack of materials using an alternating deposition process. In simple terms, the deposition tool deposits the bottom electrode material on a substrate, followed by the GST materials, and then a top electrode material. Then, individual pillars are patterned on the stack using traditional lithography tools. The patterns are etched, forming individual pillar-like structures that become the PCM cells. Then, word and bit lines are formed. The process is complicated with various challenges. In the alternating deposition step, the idea is to enable a uniform stack with clean interfaces and no defects. But the really big challenge is the etch process. Reactive-ion etch (RIE) is one way to etch the stack, effectively carving out a structure by bombarding a surface with a chemical process. In RIE, though, the GST materials may be sensitive to the plasma energy, thereby causing thermal damage. So the industry is moving towards ion-beam etch (IBE) tools. In IBE, the etch mechanism is conducted by bombarding the structure with ions. There are other challenges. Typically, DRAM, NAND and flash are fabricated in a memory fab. In embedded, a next-generation memory technology like MRAM and phase-change are built in a logic fab. In a logic fab, the transistor portion of the device is made in the so-called front-end-of-the-line (FEOL). Then, the device is shipped to a separate fab facility called the backend-of-the-line (BEOL). The BEOL is where the metal layers and tiny copper interconnects are fabricated in chips. Typically, embedded MRAM, phase-change and others are built in the BEOL in a logic fab. Generally, an embedded memory is built on top of a contact or via at one of the metal layers of a chip. In one example, TSMC recently presented a paper on an embedded phase-change memory technology in a 40nm process. In the lab, TSMC fabricated a PCM cell, which is situated between the metal 4 and metal 5 layers in the copper interconnect stack. In this flow, a doped GST material is deposited on the bottom electrode, followed by the deposition of the top electrode. The top electrode and GST materials are patterned and then the structure is connected to the M5 layer, according to TSMC. It’s unclear if TSMC plans to offer an embedded phase-change for foundry customers. It depends on demand, cost and other factors. That goes for MRAM and ReRAM, as well the other technologies in R&D, such as carbon nanotube RAMs and ferroelectric FETs (FeFETs). So which technology will become the ultimate winners? It’s unclear right now. The dust has yet to settle in the competitive and crowded landscape. Does the foundry or the foundry customer determine the memory material’s requirements?